From beginning to end, it was a wonderful holiday season with good food, good wine and most of all good friends. January 6 marked the end of the season. 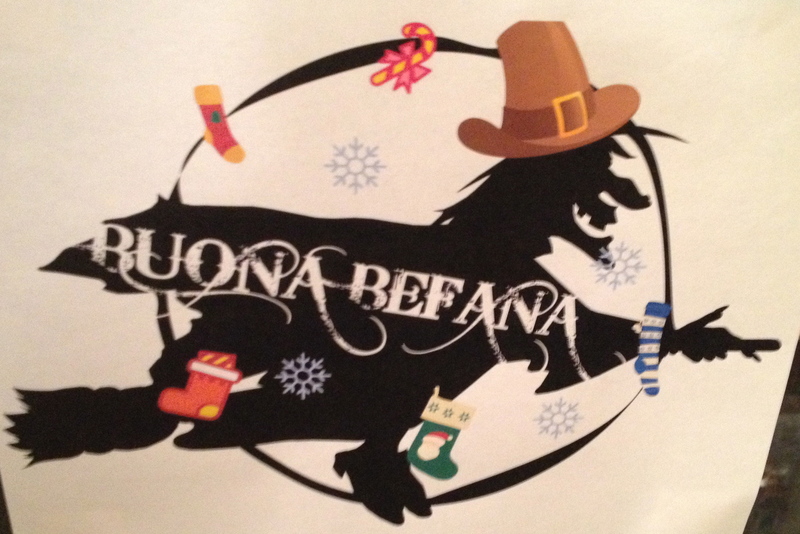 Though it is not celebrated much here, in Italy it is the feast of the Epiphany, when good Italian boys and girls receive gifts delivered by the Befana, a good witch. This year, we celebrated at the home of wine and food writers Tom Maresca and Diane Darrow. It was our third annual Befana celebration, a tradition begun by Lars Leicht, National Director of Cru Artisan Wines for Banfi. When Lars was young, he spent the summer and many holidays with his family in Anagni, a small town not far from Rome and became familiar with the Italian customs and traditions. The evening began, as always, with Champagne. 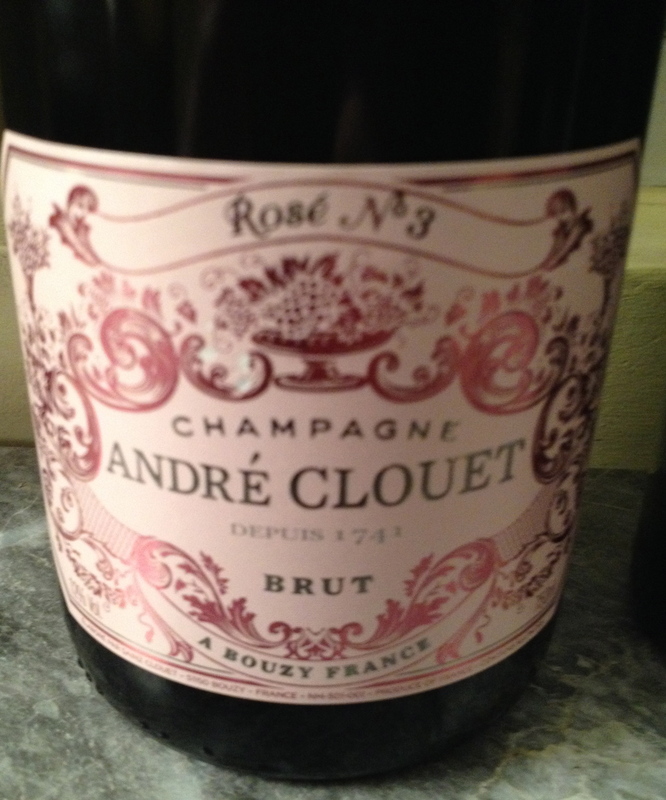 Champagne Brut Andrè Clouet Rose No 3 Bouzy 100% Pinot Noir fermented as blanc Champagne blended with 8% still Bouzy Rouge. The Clout family owns 8 hectares of vines in preferred mid-slope vineyards in Grand Crus Bouzy and Ambonnay where they have excelled as Pinot Noir specialists. The wines are cellared under the family’s 17th century village house – built by an ancestor who acted as printer to Louis XV’s royal court at Versailles! Respect for terroir is evident in these traditionally crafted wines. The labels are attractively old-fashioned in design appropriate for the descendants of a notable printer. This is a fragrant, round rosé with fine bubbles and ripe, full fruit flavors of Pinot Noir interwoven with drier, toasty complexity; excellent deep color; with hints of strawberry, raspberry and almonds. With the Champagne we ate baked Italian sausages with sweet and sour figs, a delicious recipe adapted from a cookbook by Penelope Casas. It was an interesting combination and went very well with the Champagne. Luna Mater Frascati Superiore DOC 2011, Fontana Candida Made from 50% Malvasia di Candia, 30% Malvasia del Lazio, 10% Greco and 10% Bombino. Harvesting began in the final 10 days of September and continued until the end of October, producing perfectly ripe, healthy grapes with a golden color and high sugar content. The grapes are grown in selected hillside vineyards ranging between 650 and 1,300 feet in the communes of Frascati and Monteporzio Catone. The volcanic soil is loose, porous and dry but not arid. Spalliera, Guyot and Cordone Speronato training systems are used. First selected bunches of mature grapes are picked by hand. Then the best grapes from each bunch are chosen. The grapes are transported in small baskets directly to the cellar so that they will be in perfect condition when they arrive. Three days later a small quantity of the best grapes are destemmed by hand and added whole to the fermenting must with their own natural yeast for bouquet and flavor. The berries remain in the must until the end of February. The alcohol helps extract tannin from the skins and pits. The wine is aged in 10HL acacia wood barrels, which may be the best wood for the Malvasia grapes. The barrels are not toasted and were steam folded. Mauro Merz, the wine maker, feels that barriques do not give him the type of wine he wants to produce and they are not traditional. The wine is left to age in bottles laid horizontally in the ancient tufa tunnels under the Frascati hillsides. 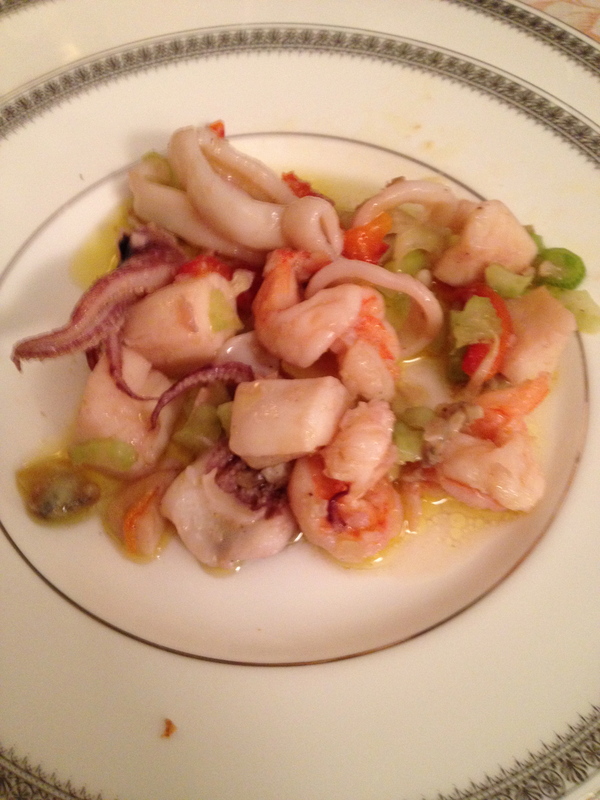 This was served with a mixed seafood salad perfectly prepared by Tom Maresca. It was a great match. 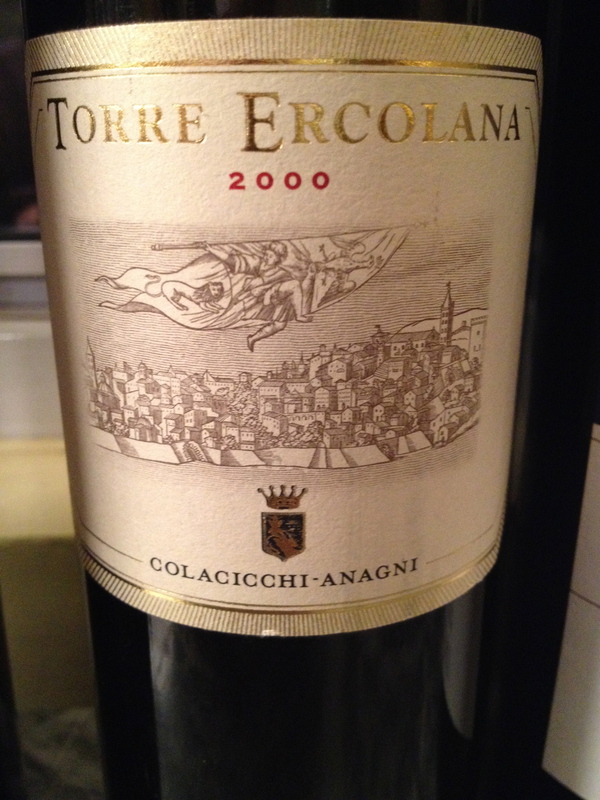 Torre Ercolana 2000 Cantina Colacicchi – (Anagni) Cabernet Sauvignon, Merlot and Cesanese di Piglio. The wine is made by a natural fermentation, no filtration, sterilization or pasteurization. The wine is aged in barrel with four rackings a year. I have been drinking the older vintage of this wine for a number of years and buy them in Rome at Trimani, a wine store (and wine bar) with an excellent selection. They have exclusive rights to the wine. It is not available in the U.S. and it difficult to find outside Rome. The wine does not always taste the same because the blend changes according to the vintage. In hot vintages the Cesanese does better so there is more of it in the blend. In cooler vintages the Cabernet Sauvignon and Merlot does better so their percentage is increased. The best however is when all three varieties ripen perfectly. Burton Anderson, in his book VINO, describes the wine in musical terms. 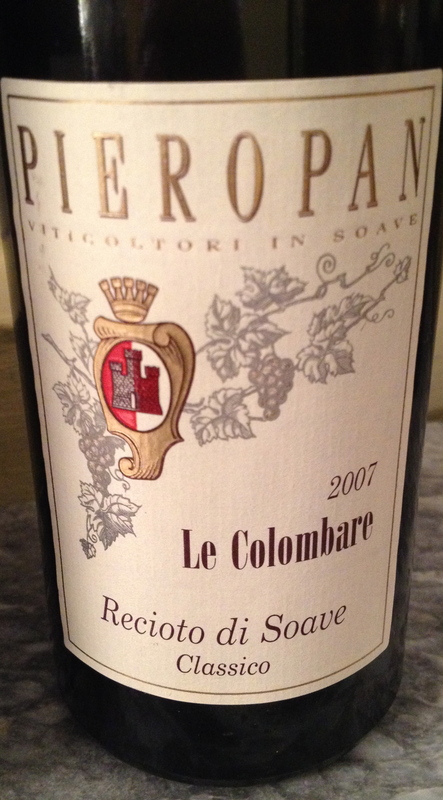 “My first mouthful of Torre Ercolana was like my first earful of Beethoven’s Fifth: so overpowering it left me gasping for adjectives to describe it.” It has hints leather, spice, red fruit, a nice long smooth finish and great aftertaste. Lars Leicht’s family is from Anagni where this wine comes from. He told us a story about visiting the winery when he was young. Lars made his famous timballo that he remembers his family making on the holidays. It is made with fresh pasta layered with tomato sauce, ham, hard cooked eggs and cheese, similar to lasagna, though much more delicate. I brought the Torre Ercolana thinking it would go perfectly with the timballo and it did. Flaccianello Della Pieve 1999 Tuscan Colli Centrale IGT 100% Sangiovese Fontodi. In magnum The oenologist is Franco Bernabei. There are 6,000 vines per hectare and the training system is guyot. Fermentation takes place in temperature controlled stainless steel tanks, with the addition of indigenous yeast for at least 3 weeks. The 1999 was aged in French oak barrels for 12 months. Today maceration is in new Troncais and Allier French oak barrels for at least 18 months. It has hints of blackberries, spice, tobacco and blueberries. There was not even a hint of oak or vanilla. 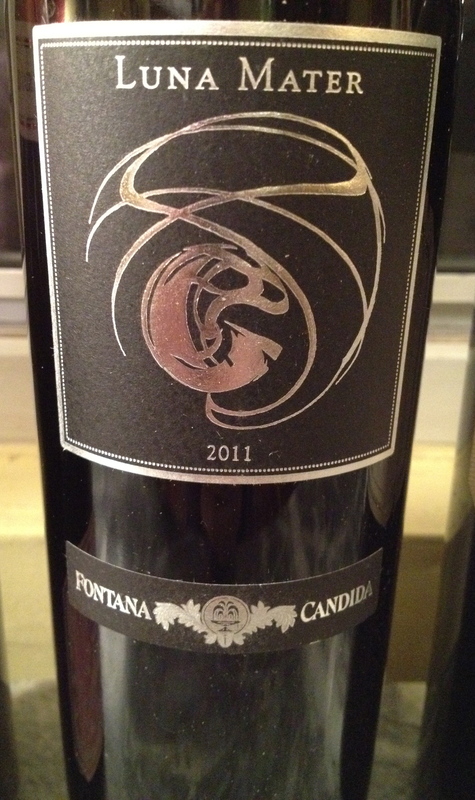 Flaccianello is one of the few Super Tuscans that I can drink and enjoy. 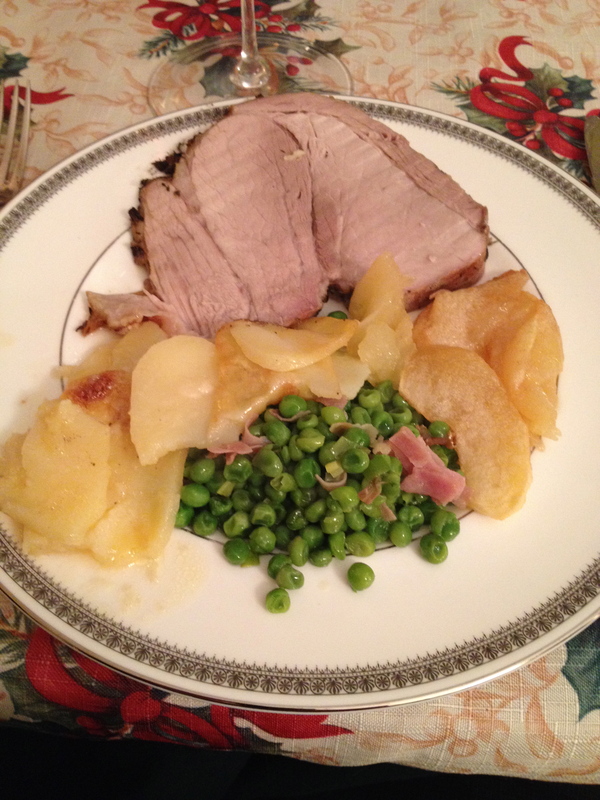 This was served with roasted fresh ham (porchetta), potatoes, pears and peas. 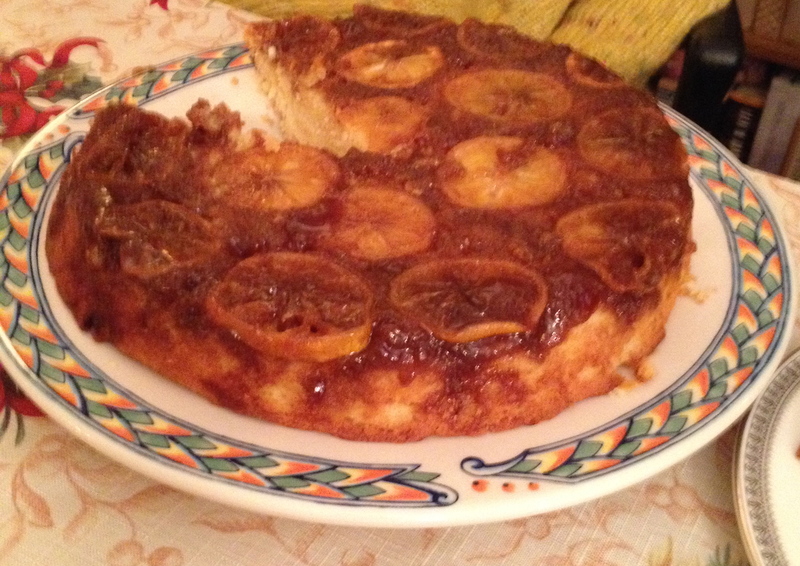 Michele made an Upside Down Meyer Lemon Cake which she adapted from the clementine cake her new book “The Italian Vegetable Cookbook”. The citrus flavor of the cake enhanced the flavors of the dessert wine. MMMmm, I’m getting hungry and thirsty just reading your post! I can’t claim to know much about wine or how its produced but I do like to read your posts as they explain the processes really clearly, so thanks!